Family Crests | Heraldic Shields & Plaques to order online! Have your Family Crest displayed and mounted onto a quality shield. Family Crest Shields provide a perfect gift solution when it comes to family and friends. All shields are individually supplied in a quality gift/presentation box and are ready for wall hanging, a prop-stand is also included allowing the shield to be displayed on a table/desk etc (please click here to view images). Simply fill in the required fields on this page and add to cart. To complete your order go to checkout where you will be asked to enter your personnel details, and that's it! 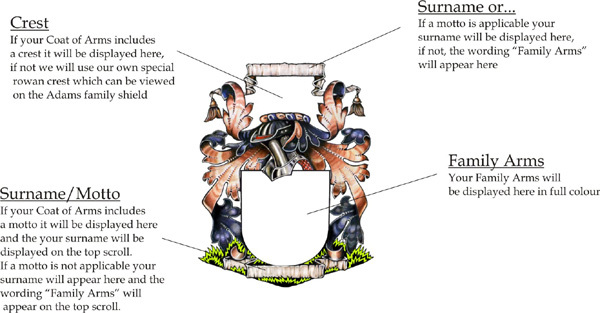 We will then research your family name in order to accurately produce your family coat of arms, to see a layout of how this is presented on the shield please see layout below. As research work may need to be carried out all our family crest shields are bespoke (made to order), so it is not possible to view your shield before purchase. We guarantee that every family crest shield we produce is 100% authentic. Approx size of shield: 185 x 155mm. Each crest/coat of arms is mounted on a stylish wooden base which is available in Light Wood or Dark Wood Finish. Click to see enlarged examples.